And so The Phantom of the Opera has had a facelift. 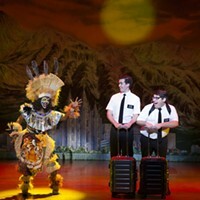 The show is only 26 years old — still running on Broadway, basically unaltered since 1988 — but producer Cameron Macintosh decided to restage and reconceive the touring blockbuster, determined to make it "bigger and better." 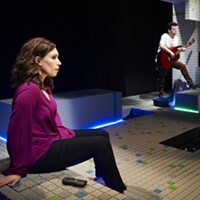 As seen here courtesy of PNC Broadway Across America, the genius lies in director Laurence Conner's simple and clever staging. 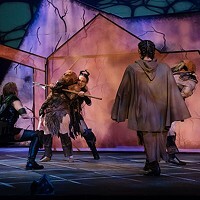 And Scott Ambler's choreography, Paule Constable's lighting, Mick Potter's sound design and the original costume design by the late Maria Björnson. And mostly Paul Brown's new set. The smart set incorporates a turntable for the first time, a towering multistory cylinder that revolves as it moves between various spaces. Sections open to reveal scenes, such as the new opera manager's office (done in blood red!). A staircase is used by the Phantom to lead Christine to his underground lair; the stairs emerge from the wall one at a time, which is possibly dangerous since both performers are wired for safety until they are closer to the stage floor. 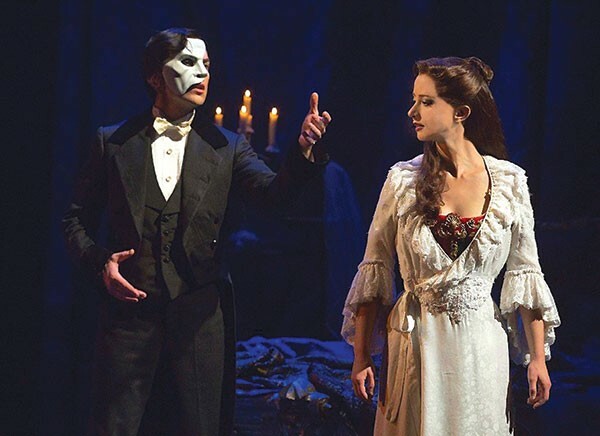 A decision has been made to make the Phantom, an addict of pyrotechnic power, younger (or at least closer to Christine's age), and stars Chris Mann and Katie Travis' chilly chemistry might well be another of Conner's choices. The show ends and begs the question: Does Christine want a career from the man who is obsessed with her, or security with her beau, Raoul (played acceptably by Storm Lineberger)? Phantom fanatics won't mind the production's nips and tucks. Andrew Lloyd Weber's sweeping score is still here (with a few new unmemorable tunes, though all singers are superb); the gondola still floats across a dry-ice lake; and the chandelier ... well, it drops from the Benedum's ceiling, but not in its previously startling way. The greatest disappointment is the phantom's unmasking. In Act I, he removes the mask to wash his face (!) and carefully shields the left side from Christine (and the audience). That's because the appliances are applied during intermission. Yet no gasps are heard when she exposes his death mask, because the infamous dramatic moment had already been squashed. But the Music of the Night won't ever end.